The Water Management department consists of two research groups. The Sanitary Engineering research group conducts research into the treatment and transport of drinking water, wastewater and industrial water: in other words the urban water cycle. The water quality and the extraction of raw materials, water, and energy from the water cycle is a particular area of focus. The Water Resources research group focuses on drought, precipitation, floods and how water behaves in the atmosphere and beneath or on the Earth's surface. The department's research is coordinated by six full professors, spread across the two research groups. Learn more about our global research ranking and excellent research assessment. Discover the innovative research of our scientists. Life long learning opportunities for the water management professional. Detailed facts & figures about our publications, scientific ranking and graduates. Ten years after Doris van Halem’s graduation, the ceramic pot filter has become a major hygiene intervention tool. The system is of a brilliant simplicity: a ceramic pot with tiny holes filters larger micro-organisms, such as bacteria, from the water. The pots are now manufactured in factories around the world, using local materials. The only drawback is that viruses, which account for various water-borne diseases, such as hepatitis, are not removed. But fortunately Van Halem discovered something else as well all those years ago. 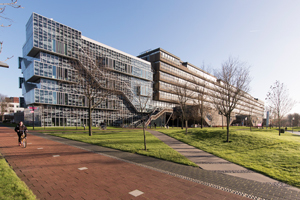 TU Delft is going to become a little bit greener on top: the roof of one of the lecture rooms of the faculty of Civil Engineering and Geosciences has been turned into a sustainable ‘polder roof’. The green blue roof can collect, store and discharge rainwater in a controlled manner. For researcher Olivier Hoes (Watermanagement) the roof is a field lab to research how this smart roof deals with heavy rains and heat stress.